If it has to do with writing, we’re interested. Our services range from ghostwriting to developmental editing, depending on who is doing the heavy lifting. Read on to see what you might be in need of. Always wanted to write a book, but never had the time? Perhaps your professional life keeps you occupied with worthy endeavors. Ghostwriting is about getting your story out of you, through a combination of recorded interviews, brainstorming assignments, and a thorough review of your field. We work through a three draft process that emphasizes efficiency and excellence to complete your prized text. Stuart has ghostwritten or co-written a dozen books in law, psychology, leadership, finances, memoir, self-help, cooking, current issues, health and fitness, true crime and other areas. Get in touch with your book idea for a free consultation. Experienced writers know that the secret to writing is rewriting. Stuart’s Book Architecture Method features a three draft process where we structure your narrative from the inside out. We break the overall timeline into achievable milestone goals — making your book better while keeping the words flowing. Whether you are just starting on your first draft, or reaching for the finish line, camaraderie and coaching can help you enjoy the ride. Stuart has edited the work of hundreds of writers, including best-sellers in both non-fiction and fiction by high-profile celebrities, academics, athletes, religious and civic leaders. Send your ten page sample and total word count for a free consultation. Here is a hand graphic that explains the story. Our editorial services, together with Book Architecture’s vendor partners, can help you achieve the full spectrum of book-related needs: from concept to publication. Here is a hand graphic that explains today’s sometimes confusing publishing climate. Download a PDF of the hand graphic. 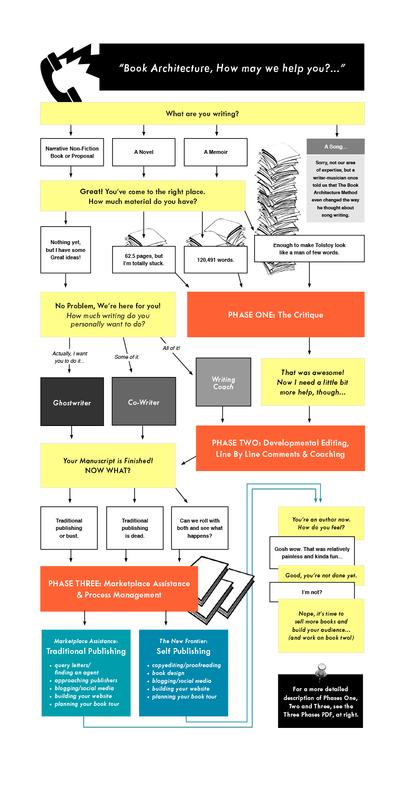 For a more in-depth look at the three phases of developmental editing (represented by the orange boxes to the left), download this PDF: The Three Phases.